Walking around Brooklyn with a camera and a pen. CHCA Garden Installation Project from Lana Zellner on Vimeo. Ground Up Designers, the folks who brought you Built and Branded and designed the Franklin Avenue Merchants logo, have just unveiled their latest project, an installation for the Crow Hill Community Garden. 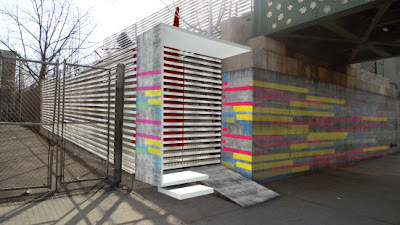 The project will rely on community collaboration for its construction, and will serve as a fundraiser for community groups including the CHCA and SOS Crown Heights. Ground Up will be launching a Kickstarter campaign to fund the purchasing of materials on January 16th, and presenting the project at the CHCA meeting the following day (January 17, 2012 at 7:30pm in the Gospel Tabernacle Church at 725 Franklin Ave). They'll also be seeking grants from around the city, and from architecture competitions nationwide. Watch this space, as well as their blog, for updates, and check out their video (above) and press release (below) for more information. Located in the Crow Hill Community Garden, Ground Up Designers’ latest community project focuses on bringing the neighborhood together to build something beautiful in memory of last summer’s Labor Day shootings. During the course of the project a canopy made of disposable color-cuffs will grow in the garden to raise awareness for organizations within Crown Heights that are working to end gun violence and hopefully inspire others to get involved. All money raised through the donations of the individual cuffs will go directly toward these organization. Each color-cuff donated to the project will stand as a symbol of it’s donor’s support for positive community growth in Crown Heights — as more and more people donate their personal cuff to the project, a mesh will begin to grow in a lace like pattern. This mesh of cuffs, created of our neighbors’ joint community spirit, will become the canopy of the installation and a place for people of meet and organize throughout the summer. Architecturally, this canopy will be supported by a framework of fanned supporting legs that connect with hinges to a base. Just as the canopy is supported by the legs, the legs are completely dependent upon the canopy. This design was chosen to represent the relationships between the community organizations that support the community, and the individual members that support the organizations — one would not exist without the other. Beginning in March of 2012, the color-cuffs will be available for donation at participating businesses throughout Crown Heights. If you make donation to the project, you will be given a color-cuff to personalize with a message and then leave in a collection box for pick up. Once a week, Ground Up Designers will collect the donated ties and add them to the installation. Over the course of spring and summer, the canopy will flourish overhead as the garden’s plants flower and grow underneath. Ground Up Designers hopes that the gathering space beneath the canopy will be used for outdoor community meetings, poetry readings, and other inspiring community events. It's the lazy week between Christmas and New Year's when, despite our best efforts, very little work actually gets done, unless you count plotting New Year's festivities (on the Avenue, Franklin Park and Barboncino will both be hosting revelers, and Grand Army Plaza will blast Brooklyn with fireworks nearby). 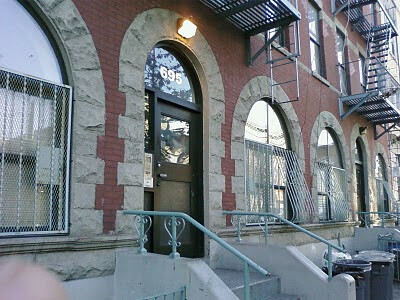 In lieu of sleuthing up any new stories, ILFA looks back at the twelve months of 2011, which has been, in retrospect, a very interesting year in Crown Heights (though it'd be fair to ask if there's any other kind). 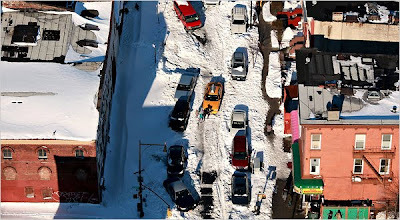 January opened with the Avenue still covered in snow from the massive blizzard (one year ago today) that put ILFA's block on the cover of the New York Times (above) and shut down the city in the last days of 2010. 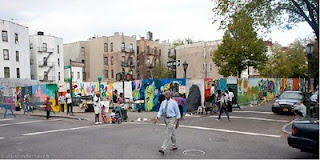 Nostrand Park started a year-long conversation about development in "Four Corners," the liminal zone at the junction of Crown Heights, Prospect Heights, Bed-Stuy and Clinton Hill, and a story I ran about MLK and libraries (told every year on MLK Day by my dad) became one of ILFA's most-read posts of the year. 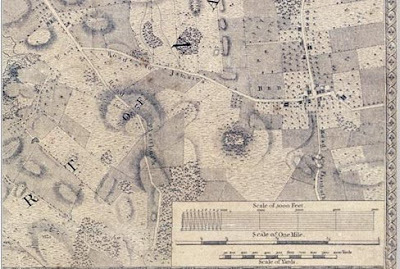 In February, the Brooklyn Historical Society unveiled a restored copy of Bernard Ratzer's 1770 Plan of the City of New York, giving us a look at Crown Heights 241 years ago, while a local Wall Street Journal reporter's look at the neighborhood today introduced us all to "ProCro", six letters that nearly exploded the blogosphere, pushed Crown Heights into regional and national debates about gentrification, and even produced a bill in the New York state assembly (more on that to come). On Franklin, Posh Nails BK opened their doors. March was a busy month on the Avenue. Local architect Manuel Avila Ochoa launched his award-winning project, Participatory Urbanism Crown Heights, while Sweet Basil and Island Thyme (the final iteration of Bristen's, which was hailed as the first of Franklin's "new" restaurants back in 2008) opened up and the Franklin Park Reading Series celebrated its second birthday with a star-studded lineup. April was a month for politicians in Crown Heights: Mayor Mike came to Franklin for a cup of coffee with local legend Tony Fisher (who had just opened Bob & Betty's) at The Pulp and the Bean, while our State Assemblyman, Hakeem Jeffries, responded to all the talk of ProCro with a proposed ban on real-estate-agent-driven neighborhood name changes that poured gasoline on the gentrification debate and kicked off another round of message-board mayhem (while the bill is nowhere near becoming a law, it did purportedly scare Corcoran into re-defining Prospect Heights' eastern border from Bedford to Washington in its materials). The short-lived Franklin Roadhouse also opened its doors, a friendly spot that never quite found its identity on an increasingly crowded and competitive Avenue. In May, a massive police raid on Franklin incensed many local residents and brought officers from the Impact Zone and the 77th Precinct to that month's Crow Hill Community Association meeting for a contentious exchange that included a threat from one officer to "land a helicopter in the middle of Franklin Avenue." Conversations about policing on Franklin (and beyond) continue - locally-written blog Epichorus has some of the best and most thoughtful coverage on the topic. In local political news, Assemblyman Jeffries put himself on the radar as a challenger to incumbent US Congressman Ed Towns next year. The excellent Built in Brooklyn Craft Fair also hosted its first event at LaunchPad. Problematic policing continued in June, with a hasty, unwarranted, and unnecessarily violent arrest by overeager Impact Zone officers, but it was also a great start to a booming summer, heralded by the opening of The Candy Rush (Rosebud Vintage also opened across the street around the same time, though it might have been in July). Brooklyn's own Howard Adamsky took ILFA on a walk through the Franklin Avenue of his 1950s childhood, and Nostrand Park launched Destination Nostrand to celebrate today's Crown Heights just a few blocks away. July brought 100-degree heat and the fourth annual Franklin Avenue Kids' Day, an event which gets bigger and better every year (look for appeals and opportunities to get involved early in 2012, as they'll be recruiting right away). The Crow Hill Community Garden bloomed big, the CHCA started a push for the continuation of the Franklin Avenue bike lane, and Owl and Thistle General Store opened up. Last but not least, ILFA got married. 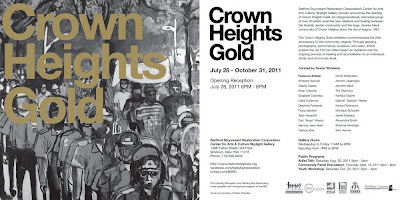 August marked twenty years since the Crown Heights Riots, which generated a plethora of conversations and events that discussed the legacy of the clashes and the state of the neighborhood today (including the exhibit Crown Heights Gold). The long-anticipated Chavela's finally opened at Sterling and Franklin (and has been packed ever since), and at the end of the month, Hurricane Irene rolled into town. The annual West Indian Day Parade brought hundreds of thousands of revelers to Crown Heights in September over Labor Day Weekend, but a rash of shootings across the city (including two incidents at the parade) marred the holiday, as did the NYPD's ridiculous arrest of Councilman Jumaane Williams. In the saddest of Franklin Avenue news, Park Place stalwart Denise Gay was struck and killed later that evening by one of 73 police bullets fired during a shootout started by a local man who walked out of his house and shot another man to death before turning his gun on the officers. While it feels trite to follow this tragedy with anything, a few other September notes: ILFA received a trio of complaints about unwarranted rooftop searches, the CHCA marked the 10th anniversary of 9/11 with its annual daffodil plantings, and Gueros Tacos opened. In October, SOS Crown Heights hosted their second-annual Week of Peace, raising awareness about gun violence in Crown Heights and celebrating their successful reduction of violent crime in their catchment area by nearly 60% over the past year. The Panama Day Parade once again wound its way up Franklin, Occupy Brooklyn hosted a General Assembly in a Panamanian storefront church on the Avenue, Barboncino opened, and a freak snowstorm postponed the CHCA's annual Halloween parade. On the last day of the month, ILFA ran our annual neighborhood-change rundown. At last count (updated as of today), there were 37 new businesses, 5 coming soon, 21 renovations completed or underway, and 20 closures since ILFA started blogging. November began with the news that the giant hole at Eastern Parkway and Franklin Avenue is on the market and may finally be something other than a giant hole in the foreseeable future (for those who've seen the photo in Pulp and Bean and assume that it's just always been a hole, there really was a building there at one point, and there may be one again soon). On the hottest block on the Avenue (between Sterling and Park), The Crown Inn opened its doors to an eager crowd and has been going strong since. Finally, December witnessed the first-ever (to our knowledge) holiday lighting of Franklin Avenue - with solar-powered lights, no less - courtesy of the Franklin Avenue Merchants. Seeds in the Middle closed out a great year of service to Crown Heights kids with Soccer for Harmony, Eve and Mike's Pharmacy opened, and Safe in this Place held their first event. Quite a year it was, and the one to come will undoubtedly be as action-packed as 2011 was. For all those who shared in the joys and sorrows of Crown Heights over the past year, may 2012 bring you health, wealth, and happiness. An extra-special thanks to all the readers who have shared their stories and thoughts with ILFA over the past year - whether you're a one-time email tipster or a message-board master like MikeF, this blog wouldn't be worth keeping without you. - The FDNY is collecting donations for the firefighters who were seriously injured fighting a fire in Crown Heights last week. - SOS Crown Heights are doing great work (violent crime is down 60% in their catchment area since they launched the program), but they still had to hold a shooting response yesterday. Support their efforts to keep Crown Heights peaceful here. 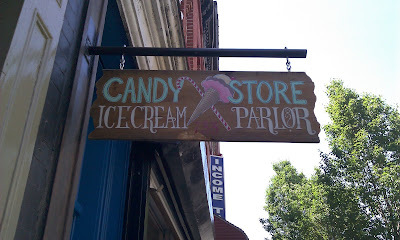 Finally, it wouldn't be an ILFA post without some notes about new businesses on the horizon. In 2012, Franklin will get its first baby store, Stork, and Prospect Heights Patch reports that Colala (Chinese and Japanese restaurant) will be open even before 2011 is over. The Brooklyn Daily Eagle reported yesterday that 505 St. Marks Avenue sold for $4.5 million to a developer, which comes out to approximately $48 per buildable square foot. The CHCA had previously reported that the property would be redeveloped as a halfway house, but this sale seems to rule out that possibility. The buyer is planning a 94,000 square foot, 128-unit, all market-rate residential development on the site of the former day care center, which sits on the north side of St. Marks between Franklin and Classon (just west of the shuttle tracks and the just-finished St. Marks Gardens affordable housing development, and across the street from the Jewish Hospital residential complex). The planned development would be a major addition to the area that Nostrand Park dubbed "Four Corners" last year as it continues shift dramatically from a light-industrial area (with some limited housing mixed in) to a residential one. 128 units is a big development - the 8-story St. Marks Gardens next door is only 38 units - and at all-market-rate, it's safe to say it's not going to attract local folks displaced by local gentrification. On the other hand, a new development on a property that wasn't residential before won't directly displace people, though it certainly precludes other uses (like a halfway house or day care center) and contributes to the overall trajectory of change along the Avenue. At the very least, this is one site to watch (along with the giant hole) over the next few months. The flyer's got all the information - if you've got the afternoon off, join the SOS Crown Heights folks in spreading peace and joy throughout the neighborhood. The Kings County Cinema Society hosts their final event of the year tonight at LaunchPad, featuring a slate of class Christmas cartoons curated by cartoon-o-phile Tom Stathes of Cartoons on Film. To ensure holiday cheer, they'll have some tasty booze on offer (donations appreciated). Should be a highly enjoyable evening - even if you're not a cartoon nut, swing by to learn more about the was KCCS supports local filmmakers and film buffs. We’ll have tasty and boozy holiday beverages for a suggested donation, and Tom will have DVD transfers of some of his vast ‘toon collection for sale for all procrastinating holiday shoppers. Details: Thursday December 22nd 8pm at LaunchPad, 721 Franklin Ave btw/ Park and Sterling. 2/3/4/5 train to Franklin Ave. The final CHCA meeting of 2012 takes place tonight (Tuesday) at 7:30pm at the Gospel Tabernacle Church (725 Franklin Avenue). CHCA meetings are always a great way to connect with neighbors in the service of building community along the Avenue, but tonight's meeting is extra-special, in two ways. First, CHCA members are contributing to two holiday drives to help those in need here in Crown Heights. At the meeting, they will be collecting non-perishable food, toiletries, and linens (specifically twin sheets, blankets, and towels) for Kianga House, a transitional family shelter located in Crow Hill, as well as warm men's clothing for those who stay at the Bedford-Atlantic Armory. Bring your donations to the meeting! Secondly, for those looking for a little more neighborly holiday chatter, the Crown Inn will be generously providing $3 drinks (one apiece) to attendees once the meeting has been adjourned. If you haven't been to a CHCA meeting yet, tomorrow's the day to do it! Sure, most people have to work all week, but that's no reason to stay home tonight, what with two great holiday parties on offer. Over on Washington, the Prospect Heights Democrats for Reform host a holiday party for all those in the area interested in reforming the bloated, unresponsive Democratic Machine that rules the borough of Kings (or at least those who want to drink and argue about politics for a couple of hours). Right here on Franklin, the brand-new and hugely-popular Crown Inn hosts a holiday party with a DJ to bring out your best Santa shuffle. They're still setting up their interior, but Eve and Mike's on St. Marks and Franklin has opened their doors. A fully-stocked pharmacy (including prescription service), they've also got a surprisingly large selection of toys, games, puzzles, stuffed animals, and other gifts (including cards). They'll be open from 8am - 10pm on weekdays and 10am - 6pm on Saturdays (closed Sundays at the moment, though that may change). Lots to do this weekend and beyond! - On Saturday, check out the final Built in Brooklyn Craft Fair of the year at LaunchPad for all your last-minute holiday shopping (rumor has it that Tea Bella Jewelry will be back at Breukelen Coffee House, too). - On Sunday, Seeds in the Middle presents Soccer for Harmony (see the post below this one), a great event for kids and adults that will also feature some crafts and gifts from the neighborhood. - On Monday, Prospect Heights Democrats for Reform hosts their holiday party at Way Station (over on Washington) from 7-9pm, featuring a happy hour and plenty of local political chatter. - On Tuesday, the Crow Hill Community Association hosts their last meeting of the year at 7:30pm at the Gospel Tabernacle Church (725 Franklin). A great event with something for everyone this Sunday in Crown Heights from Seeds in the Middle. If you're a restaurant/food service owner (or otherwise work in the industry), they're still looking for donations to feed the kids, and every little bit helps. Preview: Interview lead players from Caribbean, African-American and Jewish communities; Errol Rose, Coach Josef Cabral, Kids! Sponsors/Players Welcome - $20 to $5,000! All tax-deductible to charity! BROOKLYN, DEC. 13 - Twenty years after the Crown Heights riots, local adult players hailing from the Caribbean, Orthodox Jewish, Israeli communities and beyond face off at Hamilton Metz Field for Soccer for Harmony - named by a rabbi - a festive day in honor of kids and Christopher Rose, the “iPod kid”, stabbed to death at 15 years old in 2005 by a gang of teens over an iPod. The teams are led by Caribbean-born and Orthodox Jewish players who regularly play on the same field - but rarely with each other. The joy of soccer has brought them together to support opportunities for all kids to play organized sports and get healthy food and fitness at the heart of the obesity epidemic. The tournament supports Seeds in the Middle and the new Crown Heights Soccer Eagles league, led by former pro Portuguese player, Josef Cabral. Soccer for Harmony honors the memory of Christopher Rose and those of the many Christophers who died from violence. It supports healthy, fun youth alternatives to prevent more Christophers. Its chairs are Christopher’s dad, Errol, who has tirelessly worked with Seeds in the Middle’s programs to build community and fight gang violence and Mr. Cabral, a public school teacher, of Sporting Lisbon (Portugal), trained at the same academy as Cristiano Ronaldo, Figo and Nani. Apple CEO Steve Jobs, who recently died, called Errol several times in his moment of grief in 2005 and Apple has donated iPods, Nanos and IPad2s to further Seeds in the Middle work. 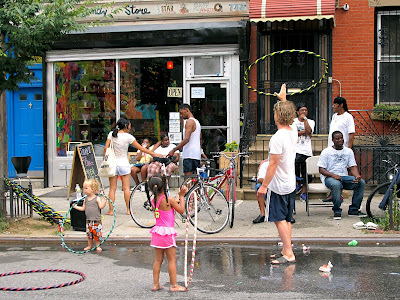 Central Brooklyn has one of the city’s highest obesity and diabetes rates. Most kids struggle with poverty and low academic achievement. Seeds in the Middle was founded by former Daily News reporter Nancie Katz and Crown Heights-born former PS 91 Principal Solomon Long in 2009. Back then, kids had no organized sports at Hamilton Metz field right across from PS 91. They had limited options for organized sports nearby, or at least affordable ones. Public funding had dried up. Hard-working parents worried constantly about their children’s lack of activities and safety. Together, Ms. Katz and Mr. Long created Seeds in the Middle and Hip2B Healthy, named by P.S. 91 fourth graders - partnering with corporations, foundations, public agencies and inspiring donors to make healthy choices easy, accessible and affordable to all. Today, PS 221 is their pilot Hip2B Healthy School - a model to be replicated in the city and beyond. It is the same school attended by Gavin Cato - the child killed in the Crown Heights riots 20 years ago. This fall, Seeds in the Middle also opened the Crown Heights Farmers Market this fall and launched the TASTES of Brooklyn, partnering chefs and farmers for kids. ILFA's been faulted for being so hyper-local that I never venture below Eastern Parkway (though, in my defense, Franklin Avenue Aromatherapy remains one of the better investigative local history posts I've done). Still, there's truth to that accusation, so today, on a tip from reader Anna (keep 'em coming, folks! 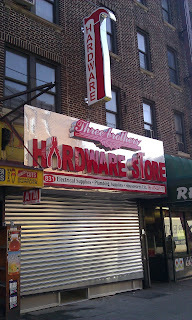 ), I walked down to check out Three Brothers Hardware, which is looking shiny and new on Franklin just south of Eastern. 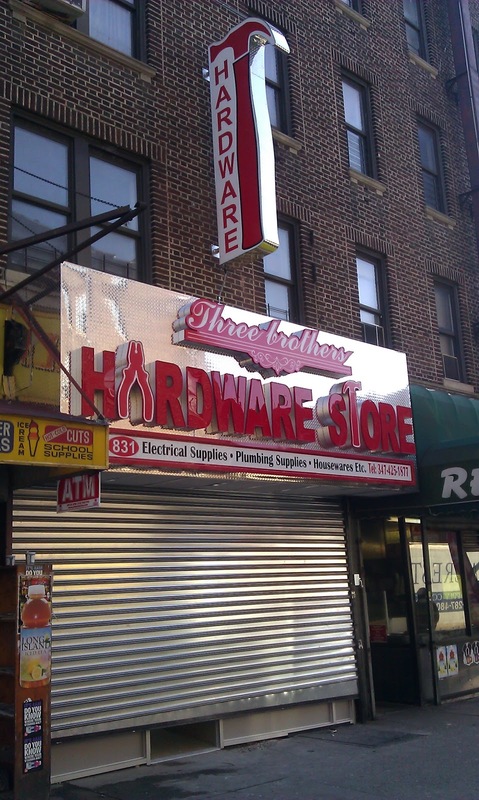 I didn't manage to talk with anyone, and they don't have a website that I can find, but it looks like it will be a classic, stuffed-to-the-gills Brooklyn hardware store, and the interior, while not ready, seems to be coming along nicely. 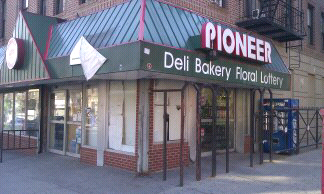 Having a new hardware store nearby should come in hand for the Fisher brothers as they renovate the Pioneer supermarket across the street. Closed this week for the massive overhaul, the second Bob & Betty's (named for their parents, who bought the businesses in the late 1970s) is scheduled to open in June 2012, with the same hours, decor, tastings, and fresh and local food they offer at their current location across the Parkway. It should be a nice addition to the final stretch of Franklin Avenue as it makes its way down to Prospect Park. So, yeah, I keep harping on this, but there are so many great places out there in Crown Heights for holiday shopping, and I'm going to keep shouting them out, especially since the Franklin Avenue Merchants put up the lights along Franklin, which were all aglow as I walked home this evening. Beyond the two photos and linked above, don't forget to check out the final installment of Built in Brooklyn this Saturday at LaunchPad from 12-6pm. If you must miss it, you can pick up many of their wares at Owl & Thistle General Store, which has been working hard to support local craftsfolk. Franklin's also got a pair of fun and funky vintage shops (Rosebud Vintage and Lasting Impressions) to check out. There's more to shopping than finding the best deal - keeping your dollars local builds relationships, strengthens local organizations, and helps create more local jobs. With great stuff on offer right here, what's not to like? After some technical difficulties with the solar panels (no good deed goes unpunished), the fully-environmentally-friendly tree lights on Franklin are up and running, thanks to the efforts of the Franklin Avenue Merchants (see video above). If you see a lit tree in front of a shop, thank the folks who run the place! In other tree-related news, ILFA received the following letter from tree-loving local Kyle, who has a number of great suggestions for ways to get and maintain trees on your block. As always, ILFA loves reader submissions - keep 'em coming! In light of your recent post mentioning the trees on St. Mark's place, I thought I'd share that I got a tree too, right in front of my apartment building on Sterling! It's a very healthy little Bald Cypress. It will have beautiful feathery green foliage in spring and summer which will turn to a lovely burnt orange or red in the fall. Best of all, this tree is here because I asked for it! I went to milliontreesnyc.org and requested a tree like this. If you request a tree now, it will be planted during next year's planting season, between October and December. For fun, here's a picture of me with my tree! See the smile? Trees = happy! On to the real reason for my email... After my tree was planted I wanted to officially adopt it, of course. So I went here to do that and saw that there are lots and lots of trees in our neighborhood that really need people to help take care of them. I really hope that you can share that with the rest of your readers, and that some of them will take initiative and help a tree nearby. Street trees do so much for us, including reducing energy costs, reducing negative effects of carbon dioxide and making our neighborhood beautiful, and they need very little in return. All it takes is a bucket and five to ten minutes a week to check in, pull any weeds, pick up any trash and water the roots. If you want to go the extra mile, you can buy a treegator (one of those green bags you see around young street trees) for about $25. If you really want to go all-out, you can plant some bulbs and have pretty tulips and daffodils in the spring! ILFA is finally done with finals and will be enjoying some high-quality reading and a $4 pint tomorrow at Franklin Park. Come on out at 8 for what is sure to be a great show (they've even got monster trivia!). This holiday season we're throwing a MONSTER BASH with LEV GROSSMAN, WILLIAM GIRALDI, NELLY REIFLER, RYAN BRITT & MONTANA RAY! Imbibe creature cocktails and cheap beer, listen to tales of Sasquatch, aliens, man-eating beasts, dragons and goblins -- along with the demons ...lurking in human hearts -- and compete in our monster trivia quiz! Prizes include books and monster merch. FREE! $4 PINTS! CREATURE COCKTAILS! MONSTROUS PRIZES! LEV GROSSMAN is the author of the bestselling novels The Magicians, The Magician King and Codex. A well-known cultural commentator, he is the book critic for TIME magazine and has written for numerous other publications, including the New York Times, The Believer, The Wall Street Journal, The Village Voice, Salon and Wired. He is a graduate of Harvard and Yale and lives in Brooklyn with his wife and two daughters. WILLIAM GIRALDI is the author of the debut novel Busy Monsters. His work has appeared in Harper’s, the New York Times Book Review, Georgia Review, The Believer, Kenyon Review and Poets & Writers. A senior editor at AGNI, he teaches in the Arts & Sciences Writing Program at Boston University. NELLY REIFLER is the author of See Through, a collection of stories. Her work has been published in McSweeney's, BOMB, Jubilat and the Milan Review, among others. She is an editor for the Recommendations section of Post Road, and she teaches at Sarah Lawrence and Pratt. RYAN BRITT writes fiction, non-fiction and plays. His writing has been published with Opium Magazine, Nerve.com, Soon Quarterly, Clarkes World Magazine, Good Magazine and elsewhere. He is the staff writer for the science fiction/fantasy blog Tor.com and teaches at The Gotham Writers’ Workshop. He lives in Brooklyn. MONTANA RAY is a writer and mother. Her concrete gun poetry appears in Lana Turner Journal, La Petite Zine and in her chapbook (guns & butter) published by Chicago-based dancing girl press (Sept. 2011). Her translations of the early work of Spanish poet Francisca Aguirre appear in Asymptote and in The Other Music: Selected Poems from the 1970s published by Brooklyn-based Argos Books (2011). Those who've attended the last two CHCA meetings have already heard about this project, a collaboration between three local residents who are students in the innovative Applied Theater M.A. at CUNY. They've offered a taste of their methods at the meetings, which involve collaborations and conversations between participants and, in ILFA's extremely limited experience, generate a very good vibe and leave participants feeling good. Check them out tomorrow at 7pm. What does it mean to be safe in this neighborhood? or call Julia at 708-408-2004. “Safe in This Place” is a research project of the CUNY School of Professional Studies M.A. in Applied Theatre. - Tea Bella Jewelry (see previous post) were such a big hit that Breukelen Coffee House asked them back today (Sunday) and next weekend too. 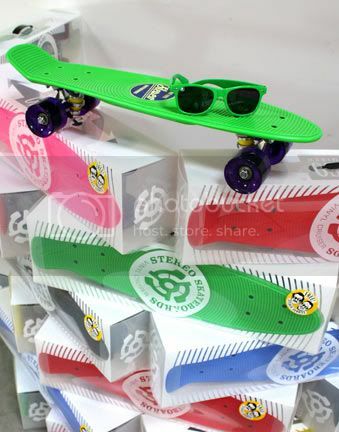 Check them out for fun, inexpensive gifts. - Speaking of gifts, the lady got me concert tickets to the Idle Warship show on Friday for Christmas. If you haven't heard them yet, Kweli's new group is fantastic (and great live), and at Southpaw on Friday, they had the benefit of a fantastic local opening act, The Band Called FUSE, who are always worth the price of admission (song/video above). - The Franklin Avenue Merchants holiday lights are up, and to honor those small businesspeople who spent their money to make this happen in lean times, ILFA's posted a list of those who contributed (see updated post below). Thanks to all of you! - I'll put up full posts about each of these events later, but the weekend does not end today. Safe in this Place, a theater-based workshop aimed at generating community conversations about safety over the next ten weeks kicks off on Monday at 7pm, and the Franklin Park Reading Series returns with Monster Bash at 8pm. - The Times had a nice piece about a local woman who suffers from Asperger's (untreated, it's left her homeless over the past several years) and the unlikely success she's had with a comic book that she created to come to terms with her condition. - The Voice ran an interesting look at Japanese dancehall groups in NYC, including those who competed at last night's Global Clash at the Albany Manor. - For those who take the B44, Bed-Stuy Patch had a good article about the implementation of Select Bus Service along the route. - A local rabbi has joined the US Army as a chaplain, which was newsworthy because the Army allowed him to keep his beard after a lawsuit (the Armed Forces have done the same for Sikh and Muslim chaplains). Lots to do this Saturday - details below. 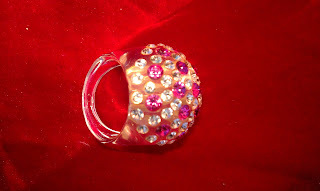 Brooklyn, NY- The Tea Bella Jewelry Holiday Trunk Show invites all to indulge their taste for simple adornment and elaborate flair, Saturday December 10, 2011. 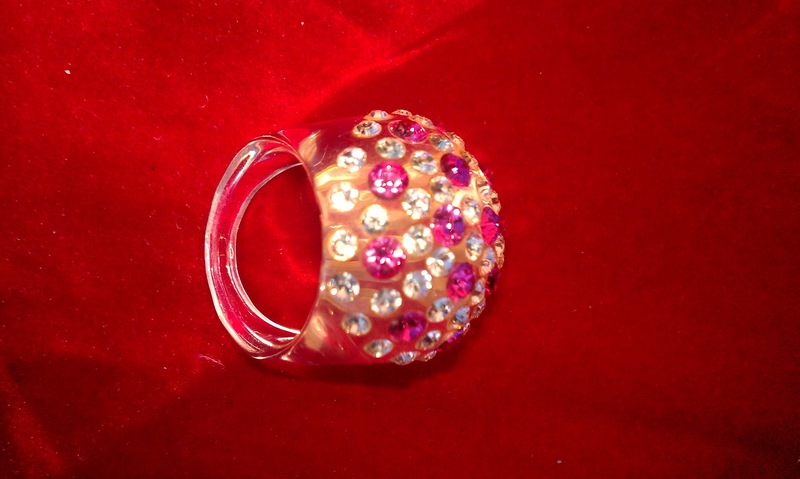 Jewelry reseller and collector, Pilar Torres-Gownder will display and sell unusual vintage and contemporary rings, necklaces, earrings, and broaches that create a conversation piece amongst friends, family and business associates. This is a must attend event for anyone who wishes to accommodate a desire to enhance a current wardrobe and buy holiday gifts that extends kindness to your wallet. Shoppers can also enjoy delicious pastries and organic coffee in the popular and warm atmosphere of Breukelen Coffee House. Each of Tea Bella's pieces emits brilliant and muted tones, conveys elegant style and satisfies a wanderlust for glamour. Costume gems are a signature favorite of this experienced collector. Festive and unique designs will make a holiday party dress or suit, exquisite. Sustainable and classic, jewelry purchased promises to tell a personal story of enchanting and playful times. Pilar Torres-Gownder will be available for style and adornment advice. About Tea Bella: A consummate business creative, Pilar Torres-Gownder combines a background in marketing and event planning to bring to Tea Bella Trunk Shows a rich visual experience. 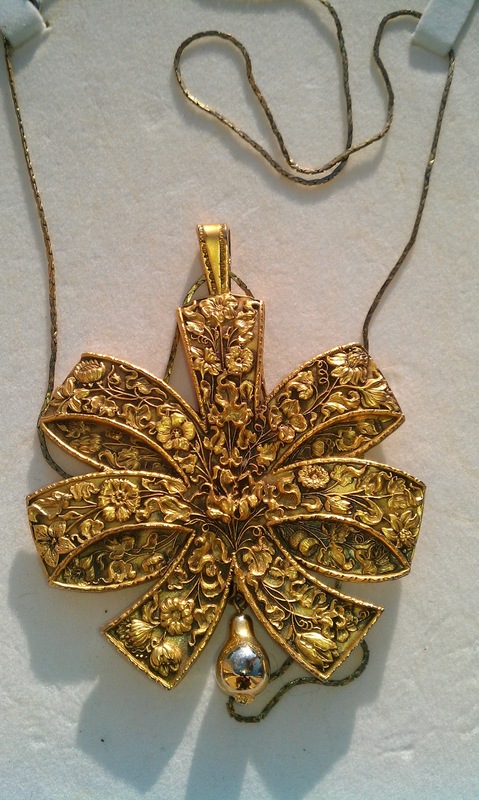 Inspired by her father who was an entrepreneur and jeweler, Pilar says "I love how the simplest piece of jewelry transforms into marvelous artwork when a client puts it on. Each client gifts me with an opportunity to throw sparkle and color that honor my passion for collecting and reselling to everyone who is just as enthusiastic as I am about adorning themselves in timeless and refined beauty." UPDATED: Let There Be Light! A great, green initiative is coming to the Avenue, courtesy of the Franklin Avenue Merchants and the Crow Hill Community Association. As of today, 16 solar-powered strings of tree lights have been purchased to brighten the way for everyone, and the Crow Hill Community Garden will soon have a lit tree as well. The weather may be far from delightful, but thanks to the efforts of these local leaders, we'll still have some holiday cheer to enjoy on Franklin soon. 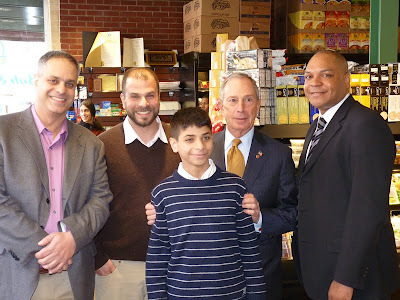 The Franklin Avenue Merchants kick off "Light Franklin Avenue". Today Solar Powered lights were purchased for 16 trees on Franklin Avenue, and one for the Crow Hill Community Garden, by members of the F.A.M. to celebrate the joyous holidays. Talk about merchants going green! Plaques will be placed on each lit tree thanking the participating business owners. Hello vegan & veg-curious friends! This is a gentle reminder that the next book swap is this Saturday. We hope that you'll be able to join us-- with or without books! We need your help to raise funds for Woodstock Farm Animal Sanctuary, a non-profit that provides shelter to cows, pigs, chickens, turkeys, ducks, sheep, and goats who have been rescued from cases of abuse, neglect and abandonment. 100% of the money raised from this event will be sent directly to the sanctuary. Even better news is that a local Brooklyn guy has offered to match donations collected at the swap (up to $200). The best news is that an anonymous donor will match all sanctuary donations collected this month up to $100K!!! There's never been a better time to come hang out, make some friends, eat cupcakes, and pick up some books for yourself and your Secret Santa! A $20 gift certificate to Chavela's Mexican Restaurant & Bar of Crown Heights. A $20 gift certificate to Terri, an all vegetarian quick service restaurant serving delicious, organic super foods seasoned like familiar favorites. Located in Chelsea. AND A MINI VEGAN BAKE SALE featuring homemade treats from Vegan Cupcakes Take Over the World! Please show the swap some love! Visit our Facebook event page and RSVP. Please also share it on your Facebook profile and/or tweet about it. The vegan book swap was recently written up in Brokelyn! "A book swap for animal lovers. (No leather-bound editions!)" We were also mentioned on SuperVegan. Is this swap free and open to all, even non-vegans? What should I bring to the swap? Bring your awesome self and no more than 5 items to swap. What if I don't have any books to share? You can buy used books for $2 donation each and thus support the critters at Woodstock Farm Animal Sanctuary! I have lots of extra money in my wallet, what should I do with it? You should totally enter our raffle! We'll have awesome prizes and the money goes to Woodstock Farm Animal Sanctuary. What should I wear to the swap? Elastic-waistband pants or empire-waist dresses are a good choice because there will be yummy vegan snacks available for purchase. 1. Check-in: Responsible for getting folks to sign in, giving them book credits, and directing them to the pile-o-stuff. 2. Media assistant: Responsible for sorting incoming media donations and keeping pile-o-stuff in order. 4. Check-out/ Cashier: Responsible for making sure folks have the right number of credits for the number of items they leave with. Responsible also for assisting with raffle sales. 5. Concession: Responsible for selling treats at the event and helping set-up/clean up snack area. Show off how busy you are here. Olivia doesn't want to be the only one Googling herself. If you wanna web-spy on Jamie. Links week (aka finals week) continues on ILFA, with a nod to the new trees on St. Marks (as mentioned in the previous batch of links, below). St. Marks between Franklin and Classon has been an interesting block to watch in the ongoing development/gentrification of Crown Heights (something IFLA covered last January - it's interesting to look back and see how much has happened in the intervening year). A relatively unlovely block by neighborhood standards, it's nonetheless attracted substantial and wide-ranging investment from public and private sources alike. The newer wing of the former Jewish Hospital of Brooklyn (which admittedly lacks some of the charm and majesty of the facades facing Prospect and Classon) was completely renovated as rentals, attracting a laundromat, a diner, and Compare Foods to the complex (two years ago, that building had almost no windows, and the current Compare Foods location was home to a pair of vociferous guard dogs). Across the street, the city's St. Marks Gardens project is almost complete, and a halfway house is moving in to the former daycare center (as reported at the CHCA meeting). The ISHI condo project, renamed Mark West, seems to be attracting some renewed interest, and crowds still gather at the Imperial Bikers Motorcycle Club on Saturday night and the Apostolic Church on Sunday morning. There's no verdict to declare yet, of course, as the area is most certainly "in transition," but the range of investments suggests the possibility, at least, of a continued coexistence. - For a broader, longer look at change in Brooklyn, check out Kay Hymowitz's piece in City Journal. 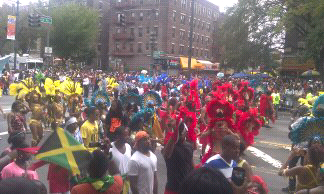 - The NYPD are in trouble after officers took to Facebook to bash West Indian Day parade-goers back in September. The chatter came to light after it was used (no word on if it made an impact) in the acquittal of a Brooklyn man charged with gun possession at the 2010 parade. - Over on Rodgers Avenue, police were in better form, pulling a worker to safety after the scaffolding he was standing on collapsed, leaving him dangling from a rope (scary stuff, glad he's safe!). - Prospect Heights Patch has an interesting article about the gerrymandering of Congressional Districts, and how it could affect representation in Crown Heights. Tropics of Meta: Historians Respond to "Lincoln"
HuffPo NY: Who Wears the Crown? Sue Rock Originals Everyone, Inc.
It’s Time to Have a Conversation…. Survey: Calling All English Teachers! Do Your Students Write Fiction?